Winter came early this year. Up in Maine we got snow on Thanksgiving when usually the white stuff holds out until the end of December. This was not good for my dry and sensitive (aka angry and high maintenance in the winter) skin. Everyone experiences some degree of skin dryness unless you’re lucky enough to live in the rain forest. So you don’t get to that point, I have come up with four products for your body, hands, face, and lips that will keep your skin satisfied all winter long with minimal applications. 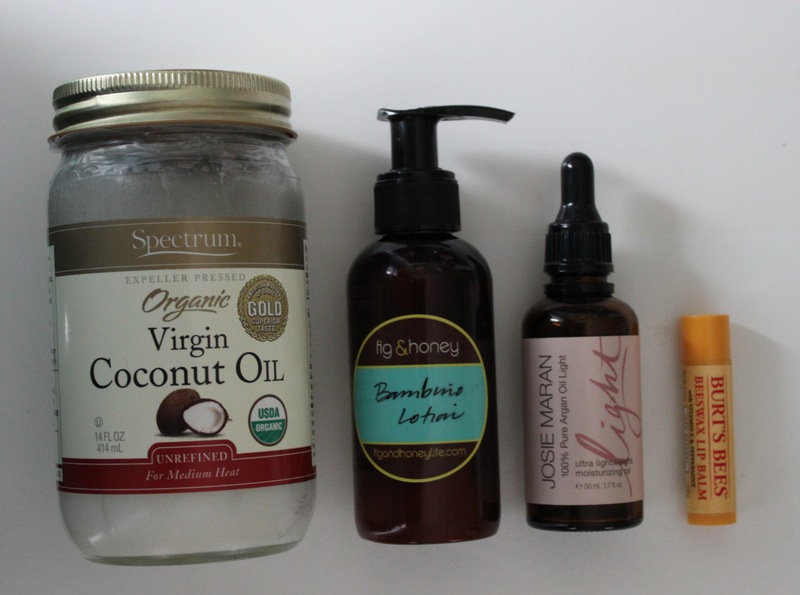 All of these products are natural, cruelty free, and really do work! Remember how in My Big Fat Greek Wedding, Windex was considered a cure all? Coconut oil is kind of the same idea, but less chemically. There are soooooo many health benefits of coconut oil and ways to use it. Coconut oil can kill bacteria, it’s great nutritionally, you can use it in your hair, or what I like to do, use it on your skin. The fatty acid in coconut oil makes it easy for your skin to absorb. And there are obviously no artificial scents, which can irritate skin, yet the oil smells amazing. It’s like a tropical getaway. You can find coconut oil at most grocery stores. When you’re buying the oil I would recommend getting unrefined because some refining processes use chemical distillation that use harsh solvents. I also like to make sure it is USDA Organic Certified. And as a personal preference, I like the pressed oil, which is come is a more solid form. I find its easier to put on, but again, personal preference. Bonus tip: don’t try to put spandex on right after you apply it. It will feel gross. Coconut oil usually need a minute or two to dry on your skin. Even though I have been searching for the ultimate hand lotion since November, I’ve only recently come across Fig & Honey. I was looking for something natural and with few ingredients and let me tell you, it wasn’t easy. So after searching and trying lotions for a month or so, I finally stumbled upon Fig & Honey’s website and ordered this lotion out of what was most likely desperation. When I got it in the mail, I was beyond exited to find out it worked. This lotion is made from olive oil, aloe, and neem oil with essences of yarrow, rose, chamomile, and vanilla. Because it has an olive oil base, it does take a second to dry and soak in, but after that you don’t have to worry about greasy residue. I love that it keeps my hands moist for a long period of time so I don’t have to worry about constantly reapplying. The smell is definitely on the earthy side, but I like it. I also like the fact that the smell isn’t overwhelming. I can apply a heaping amount and don’t have to worry about killing my coworkers with the overpowering perfumes most hand lotions have. Ingredients are very important to Josie Maran. With her cosmetic line she hopes to prove that make up doesn’t need to be bad for you and that luxury and conscience can come together in the cosmetic industry. What I love most about this moisturizer it that it is made out of one ingredient. It was easy to assure myself that I wasn’t slathering on something full of chemicals that weren’t safe. The oil is sustainably harvested, uses fair trade practices, and uses eco-friendly packaging. And on top of that it serves as a primer for your foundation. I have tried tons of lip balm and chap sticks and in all my years and I don’t believe any come close to Burt’s Bees. I love the peppermint scent and how it tingles and soothes chapped lips. You can find it at most pharmacies and grocery stores, which is super convenient. Ingredients are very important to the people at Burt’s Bee’s. They are committed to using ingredients that work with your body naturally. It is probably no surprise that this chap stick is made mostly of beeswax. I also love Burt’s Bees commitment to sustainability. In order to reduce their carbon footprint, Burt’s Bees use energy-efficient lighting, resource management software, and efficient production equipment. Categories: Uncategorized | Tags: Argan Oil, Beauty, Burt's Bees, Chapstick, Coconut Oil, Cruelty Free, Face, Fig & Honey, Hands, Josie Maran, Lifestyle, Lips, Lotion, Makeup, Moisturize, Natural, organic | Permalink.